PHOTO BY JONO KINKADE CONDEMNED: Widespread outrage and the consideration of an ordinance to significantly restrict native tree removal followed the clear-cutting of thousands of trees on Justin Vineyards and Winery’s Willow Creek property east of Paso Robles. As shock and anger caused by the massive removal of native trees on a property owned by Justin Vineyards and Winery subsides, the policy debate about how to respond trudges on. And it’s quickly becoming anything but clear-cut. The San Luis Obispo County Board of Supervisors passed an urgency ordinance on July 15 that tightly restricts native tree cutting. It only lasts 45 days, and on Aug. 16 the board will consider whether to extend it for up to two years or let it expire. The urgency ordinance received the four-fifths vote needed to pass only after 4th District Supervisor Lynn Compton gave her reluctant support, saying she would be hard-pressed to support an extension or anything more strict when it comes time to consider a permanent ordinance. Her stance makes ordinance supporters nervous. Many farmers and residents in the Adelaida area—a place prized for its wine, privacy, and majestic beauty—say that traditionally, oak trees are off limits and the unwritten rule is to plant around them. “If there’s trees on the property, there’s trees on the property,” one winery owner said. Some residents are worried that Justin Vineyards’ actions may change the game and put large swaths of otherwise “off-limits” land into play—and in turn more pressure on the limited groundwater—unless the county’s leadership passes strong new protections now, while a permanent ordinance can be developed. Two decades ago, an attempt to pass a native tree ordinance was defeated because the agricultural industry diligently opposed it. The industry said that regulations weren’t necessary because landowners respected trees and wouldn’t clear-cut them and the red tape would complicate and debilitate their ability to manage their land. While some people have changed their mind, those arguments are reemerging as opponents also say the ordinance is an unnecessary overreaction to the work of one bad actor. “We do not agree with the individual whose decision making and actions has prompted this [urgency] ordinance. 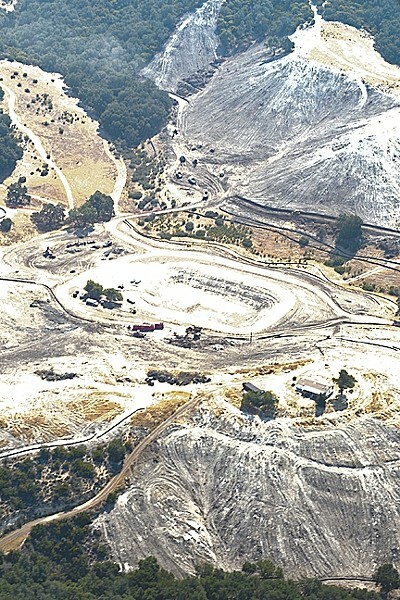 We do not agree with what they did,” said Mike Bonnheim, whose family owns a sprawling ranch near Lake Nacimiento, at the July 15 meeting. He also said the ordinance was too focused on preventing cutting and neglected to accommodate cutting associated with land management. For that reason, Bonnheim—who operates his ranch under a controversial conservation easement that allows him to remove native trees as part of ranching operations and hosting a hunting club—said the ordinance would negatively impact stewards like him. “My family can’t support it. You cannot manage a resource with a one-size-fits-all recipe approach,” he said. But Bonnheim is also among a handful of property owners in Adelaida who have removed a significant amount of trees. It was apparently done for land management purposes—he’s also sold firewood in the past—while many of the tree clearances done on other properties in recent years have been to convert the land from forested to vineyards. In fact, aside from Justin Vineyards’ properties—in addition to the recently clear-cut property, the company cleared 100 acres of trees in 2011—all accounts point to Bonnheim’s ranch as having the largest recent tree removal in the area. Google Earth shows approximately 100 acres of vegetation removed from a jagged hillside on his property, just north of the original Justin Vineyard property on Chimney Rock Road. From an aerial view, it looks like the roots were largely left intact—which can allow plants to grow back. Several oak trees north of the hillside appeared to be sick or dying. Still, the area was stripped bare. A couple of experts on California native plants weren’t quick to jump to conclusions—one said it could have been predominately brush (though there were indications of both oaks and gray pines) or there could have been a fire. Bonnheim could not be reached for comment. Considering the potential for more tree clearance, supporters say that while the ordinance may not be perfect and there may be only be a few bad actors, new restrictions are needed because the stakes—and demand for plantable property in that area—are too high. As Chipping noted at the July 15 supervisors meeting, the woodlands in Adelaida have remained largely intact. But some haven’t. On Adelaida Road, there are two properties where approximately 20 acres of woodlands were removed in recent years, and a few more that saw clearances of less than 10 acres. Vina Robles recently purchased three contiguous parcels totaling about 430 acres. One of those properties was purchased from Georges and Daniel Daou, owners of Daou Vineyards and Winery, who cleared several stands of trees before it was sold. In an email to New Times, Daou Vineyards Senior Vice President Maeve Pesquera said the property was owned privately by the Daou brothers, not their company, and they worked in compliance with all county codes to “clear some brush, diseased trees, and a small amount of other trees with the intent to plant vines” and that the vast majority of that clearance was brush and dead trees. Pesquera also said the Daous fully support ordinances to prohibit native tree removal and building large reservoirs. Vina Robles—one of the largest wineries in SLO County, which traditionally grows grapes east of Paso—has purchased land in Adelaida, demonstrating a renewed interest in the area from the larger, capital-rich companies. The company is joined by J. Lohr Vineyards and Wines, which has removed some old walnut trees and is prepping land. While Vina Robles—which sports an idyllic oak tree on its logo—could greatly increase plantable acreage with more tree clearance, Hans Michel, co-owner and managing partner of the company, said it’s not likely. Michel said he values the trees and historically hasn’t removed any because most of their vineyards were planted on already-open land. But the company was permitted to drill a 1,600-foot deep well, uncommon in the area, and it’s also filed papers for two large irrigation reservoirs. Both strike a nerve for deeper fears in the area over water. As for the tree ordinance, Michel said he stays out of local politics because the winery is co-owned by two Swiss families, so he’ll be maintaining a neutral position on the issue.